Try doing this beneficial physical activity to tone your leg muscles. Do this exercise regulary to stay healthy. This exercise is best for your triceps since they focus almost solely on your triceps muscles. You'll definitely get stronger, more defined triceps than ever before. 1. 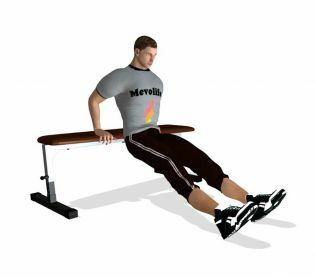 Grip on the edge of a bench with both hands, straighten your arms and bent your legs at about ninety (90) degrees on the floor. 2. While keeping your chest up and shoulders back, lower down so that your elbows are parallel to the floor or slightly further. Raise yourself back to the starting position.